The bearded Herakles, head turned slightly to his own left and down, represented in terminal form. He is completely enveloped in the lion's skin, the head of which is set in the crook of the left arm above the hand; the left hand grasps a fold extending from the right shoulder and the right holds a leg of the skin dangling below the chin. The leaning posture of the body is heightened by incorrect resetting and the angle of the mounting for photography. 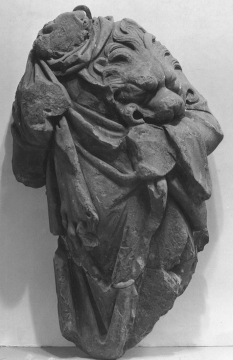 This mutilated terminal figure is of a widely found type of the bearded Herakles with shoulders and arms fully draped in the lion's skin and with both hands holding the drapery close to the chest, (cf. Jones, Cap., p.321, no.15, pl.80 and the variant type, Jones, Cons., p.249. no.99. pl. 897 with the club in the left hand and the head of the lion's skin hanging down at the left side below the arm. The former notes that such herms were frequently set up in gymnasia; cf. A variant in relief of the type from Troy, Troja u Illion, II, 53, and p.430, and the red marble herm from Sparta, Tod and Wace, Sparta Museum, p.177, no.442a and b). Of the second type catalogued by the British School, the original may have been of the Fourth Century, but later the type with variants seems to have been common in Spartan gymnasia (see above and Ath. Mitt., II, 1877, p.343, no.83). Pausanias speaks of a herm of Herakles at Megalopolis, and numismatic evidence would relate it to these figures. For the type with the arms in the Soane position, compare Amelung, VC, I, p.460, no.225, pl.47, and for the position of the type standing in transition from the strong to the pathetic Herakles in later Fourth Century Greek artistic expression, see Furtwängler in Roscher, Myth. Lex., I, col. 2170 and bibl. Termes of Herakles are collected in Reinach, RS, II, 2, pp.522-525; the example, with lion's skin below the arm, in the Villa Borghese (LXXXVI; Einzelaufnahmen, no.2730) is of early Third Century A.D. workmanship and has shaft and base restored, as is usually the case. It has the flat, wall-fixture profile of the Soane fragment. For comparison as to material (usually these ate white marble), there is a terminal figure in Berlin of black marble, with the original wreathed head in white (Bes. ant. Skulpt., p.80, no.187); the figure was procured in Rome in 1791, and again the arrangement of the head and folds of the lion's skin closely parallel our figure. We can imagine that from Hellenistic practice, these terminal Herakles types were extremely popular in gymnasia and baths throughout the Roman world a fact which accounts for the numbers found in museums today. In many instances they were set up in pendant pairs, like wreathed busts of the Genzano Herakles type, with the heads turned right and left so as to face each other. The connection of such terminal figures with the gymnasium and with athletic sculpture in general can be illustrated in work of the early Imperial period by the statue called Il Paestrita di Koblanos, found at Sorrento in 1888 and now in the Museo Nazionale, Naples. A terminal figure of our type appears as the support for the marble of the youthful boxer and represents an addition on the part of the Aphrodisian copyist in the First Century A.D. (Squarciapino, La Scuola di Afrodisia, p.24ff., pl.I; Ruesch, Guida, no.212). The appearance of the terminal Herakles in funerary sculpture is a subject in itself; these are often, however, devoid of other than decorative significance, although in instances when placed beside a sepulchral figure they may serve to characterize the deceased. A sarcophagus in Delphi (Robert, III, 3, no.433, p.517, pl.CXXXVIII, Phot. 24720 Alinari) shows an unusual combination of a motive found quite frequently in the decorative sculpture of this collection, a pair of griffins flanking a candelabrum (as the cinerary vase, above, no.345; M 839) and two of our terminal figures as supports at either side corner of the front panel.